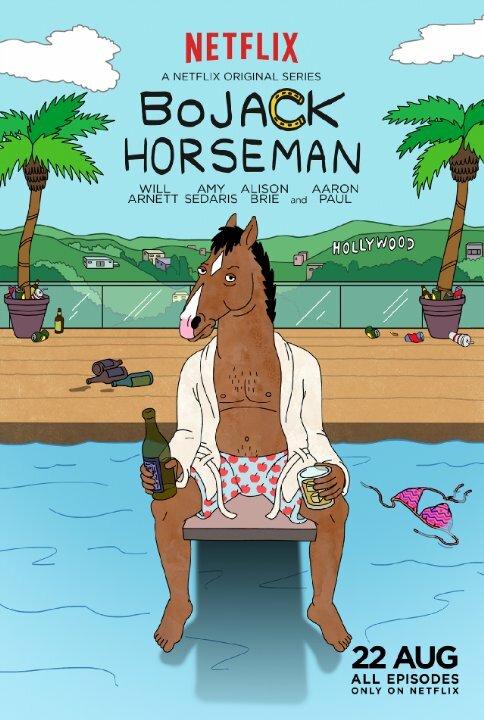 Synopsis: Washed up 90s sitcom star BoJack Horseman (Will Arnett) struggles with his autobiography. Recruiting a ghostwriter named Diane Nguyen (Allison Brie), BoJack’s life gets further into a haze of insanity and drugs as she gets to know him. The entire concept of BoJack Horseman sounds like the strange lovechild of Regular Show and Ugly Americans. In a world where humans and anthropomorphic animals exist side by side, we’re acquainted with the tale of BoJack Horseman, the horse from the 90s sitcom Horsin’ Around. Already, it sounds like something from the world of Regular Show. BoJack’s life has gone downhill since the show ended in the 90s. He has an on again, off again relationship with his agent Princess Carolyn (Amy Sedaris), no one takes him seriously, and his roommate is a freeloader named Todd Chavez (Aaron Paul) who just randomly showed up at his house one day. He has a deal to write a book about his life, but he keeps delaying on it so much that his editor assigns him a ghostwriter named Diane Nguyen, who happens to be dating his rival Mr. Peanutbutter (Paul F. Tompkins). I have to admit, BoJack Horseman gets off to a rough start. The first few episodes feel like a mediocre Adult Swim show with Netflix rules. It manages to get some laughs and some smart jabs at Hollywood culture, but you kind of wonder how a show that features a horseman throwing up cotton candy off the side of his house managed to get on Netflix. But then, somewhere around the end of episode three and going into episode four, the series starts to find its legs. The more we see BoJack’s character and how Diane’s presence is making him look in on his life. I mean, not like it was fantastic to begin with, but for the first time in a while, BoJack actually seems to look at where his life goes wrong and why it keeps going wrong. For a show about a drunk and depressed anthropomorphic horse, it certainly gets more emotional than it has any right to be. It also gets genuinely funny. Besides having an Arrested Development style continuity in terms of gags, it also just gets smart in how ridiculous it is. 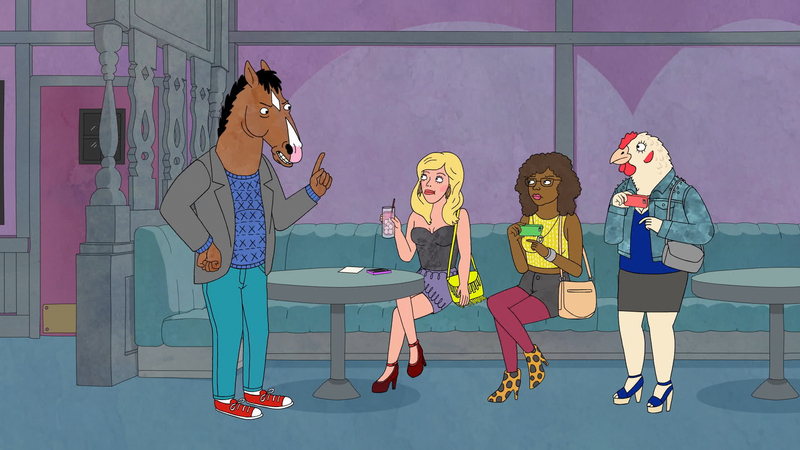 ‘Our A-Story is a ‘D’ Story’ might just be one of the funniest episodes of an animated show that I’ve seen this year, with BoJack getting drunk and stealing the D off the Hollywood sign for Diane (causing it to be referred to as ‘Hollywoo’ for the rest of the season), the biggest stream of Beyoncé puns I have ever heard in less than a minute and Todd being courted by two different prison gangs. I can’t really properly explain how much this episode just works and is probably where the series really starts getting good. Really though, the best gag of the entire series is Vincent Adultman, who is very clearly three children in a trench coat. The episode that really combines the drama and the comedy though is the penultimate episode ‘Downer Ending.’ I think the best way to describe it is what would happen if you mixed ‘Duck Amok,’ Adderall, and the finale of Neon Genesis Evangelion. Hyperactive animation, insane jokes at the expense of the characters being completely coked out of their minds, and the inevitable drug addled introspection. It’s weird, but it has to be in order for it to get its message across and get BoJack to where he is in the season finale. By the time we get to the end of the season, it’s very obvious that the first few episodes were something of a trojan horse (pardon the pun). What could have easily have been just the drunken shenanigans of a washed up 90s star becomes an uncanny tale of a man who’s looking to redeem himself somehow. He just doesn’t really know how to do it. Perhaps it’s on the horizon with season 2? Final Thoughts: BoJack Horseman does indeed get off to a rough start, but it becomes a hilarious and poignant story of a depressed man seeking his own redemption. It also keeps a great continuity as well as an impressive voice cast. If anything, stick around for Tompkins as the ever excitable Mr. Peanutbutter and Paul as Todd. I really, really enjoyed BoJack Horseman. I just have no idea why. Besides the magical voice of Will Arnett, anyway.